Mother's Day is supposed to be a day of appreciation, of chocolate and flowers (hint hint) for the person you love more than life itself. It's also a day fraught with pitfalls, because there are many ways to screw it up. 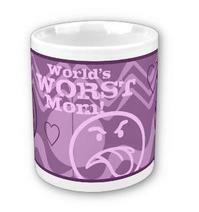 For example, buying your mom a gift from the list of the 15 Worst Mother's Day Gifts Ever. Then again, if you really can't stand the person you are obligated to buy a gift for, any of these will broadcast your passive-aggressive feelings quite adequately. The list is conveniently divided into "Bad gifts for Good Moms" and "Good Gifts for Bad Moms".